From the kitchen of One Perfect Bite...This is another light soup developed to span the seasons. It's substantial enough for a meal but lacks the heaviness associated with winter soups and chowders. It's often served in fishing camps and it's familiar to folks who live in Oregon and Washington, especially those who live on the islands in San Juan archipelago. This is really simple to assemble and its another great way to use the tail ends of whole salmon. The one ingredient that might cause some consternation is the fish stock. It can, of course, be purchased, but there are less expensive alternatives that can be used. Bottled clam juice, diluted with an equal measure of water, is the easiest alternative, but my favorite substitute is a light broth made from shrimp shells. We have shrimp frequently and rather than throw the shells away I freeze them until I need fish stock. I simply cover the shells with cold water, bring it to a boil and simmer for about 30 minutes. Once strained, it makes a perfect stock for soup. I keep the other ingredients in this soup to a minimum so the flavor of the salmon stays the star. If you prefer a thicker soup, puree a portion of the soup, just before adding the salmon. Here's the recipe for this spring favorite. 1) Melt butter in 4-5 quart saucepan or soup pot over medium heat. Add onions and saute for 5 to 6 minutes. Stir in garlic and cook until fragrant, about 1 minute longer. Add fish stock, chicken stock, tomatoes, sugar and thyme. Bring to a boil, reduce heat and cook, uncovered, for 5 minutes. Add potatoes, lemon juice and salt and pepper to taste. Cook, covered, until potatoes are tender but still retain their shape, about 12 minutes. 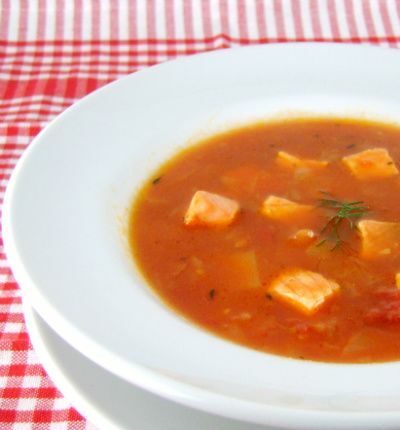 2) Stir salmon into soup and cook until fish flakes easily, about 3 to 4 minutes. Sprinkle with dill. Yield: 4 servings. You are making me hungry once again! What a lovely salmon dish, Mary! Salmon is one of my fave fish. Is it lunch time yet? That looks so good! 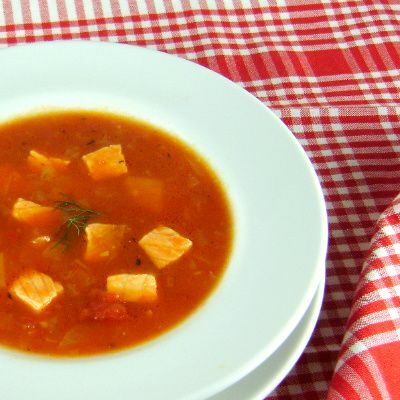 Mary - that looks heavenly - little cubes of salmon nestled in this wonderful tomato, dill broth. So light & lovely and not loaded with cups of cream. Wow, another amazing recipe from you wonderful blog. I'm not sure I've had salmon in soup before. It looks absolutely lovely. Salmon is such a great ingredient. The soup looks filling and good. I am going to make sure my husband makes this soup. Everything about it looks and sounds delicious! What a lovely looking soup! I've always wanted to visit the PNW- this is just what what I'd expect to eat and enjoy! What a georgous & tasty salmon soup this is, Mary! Just look at that radiant colour,...yummmm! Just had my lunch...but I still have appetite for this good-looking salmon soup. Oh Mary I just love it!You share a very delicious feel good soup recipe and I am making it tonight! As much as we like salmon I've never made soup with it! This looks delish! I am absolutely crazy about dill and therefore you have sold me on this soup. It looks beautiful! YUM! What a great looking soup! Lovely pics as well . Mary, the soup sounds delicious...Salmon and dill together my favorite combination!! Beautiful looking soup, this must be perfect for the beautiful spring weather you are having now! This looks so good, what a great soup for any season! Soup looks very inviting . Love those healthy as well as tasty ingredients very much. What a great idea to keep the shrimp shells for fish stock...I never thought of that! The soup looks like it would be 'just enough for a meal. I like those lighter meals! Salmon and dill are such a classic combination, and one of my favourites! I can almost taste this wonderful soup! questo piatto è irresistibile! ciao! I feel like breaking out in song..."these are a few of my favorite things." Yummy, yummy---and good for the tummy. Oh wow, thanks for such a great recipe idea! I have a piece of salmon that I need to use up and I'm tired of the standby ways I have of preparing it. This sounds delicious. Think I'll try it tonight. This looks like a lovely soup. I'm going to remember to freeze shrimp shells to make the stock. I'm definitely making this - my husband would be in salmon heaven and it is so easy. Plus it's just so pretty! That does sound light and delicious for rainy springtime weather. Never tried a salmon soup before. I must say the picture is beautiful and that alone makes me put this on my "try" list. Thanks. This looks really good...I wish I had a bowl of it right now! I love the dill addition!! I like to make my own fish stock...I just don't like the taste otherwise. This salmon soup is such a lovely color and looks delicious, Mary! Pass the French bread for dipping, please! I have to say I have never seen this combo before and it looks so good and perfect for this season! «Louis» and fish don't understand each other. However, Mme la Vache would enjoy this very much. Beautiful soup--a nice combination of flavors and perfect for any season. Wow, this turned out so fabulous! It reminds me of my mom's manhattan chowder which I haven't been able to replicate. Thanks so much for the recipe, it's going in the regular rotation box! Thanks so much for stopping by my blog and your kind words! I noticed you like Penzeys Spices! How exciting! I don't know many others that are fans. I have been meaning to do a review on it, so I'll let you know once I do. PS - this soup looks delightful. I rarely prepare salmon outside of grilled, sauteed or in sushi, so this is inspiring and better yet, healthy! I like the idea of lighter soups for the warmer months. I never seem to eat it except for during winter. Looks tasty! I really love the sound of this soup - so light and and yet flavorful. We eat a lot of salmon and yet I never think to make a soup with it. Thanks for sharing!